I'm uploading this little canvas to Unity Stamp Company's Friends With Flair Friday. I used the Heart/Flag stamp that I got in a grab bag from Unity and my favorite background stamp - Stars of Worn. To get color on the heart stamp I used two small dabbers. I just dabbed on the distress inks to the stamp and then stamped it and cut it out. I used Barn Door and Faded Jeans Distress Inks. I also used the dabbers to create the striped background. I stamped the Stars of Worn background with white ink for the background. I used a blue Stamper's Big Brush Ben around the edge of the stamp and around the edges of the little canvas. I smudged the edges with my fingers. 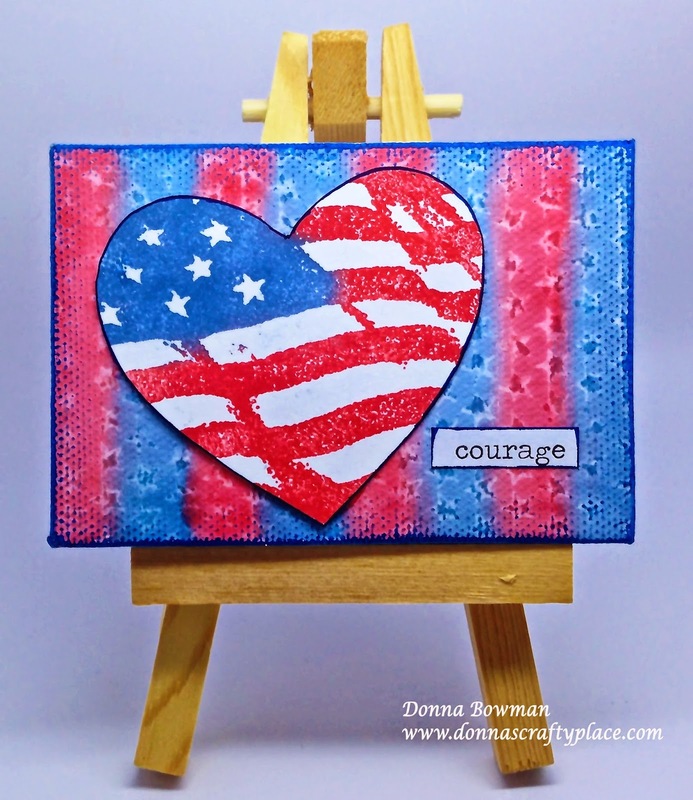 The word courage is from Tim Holtz Chit Chat and I used the blue pen around the edges of the courage sticker also. The size of the canvas is about 3x4. The easel is fun to use in your house and you can switch out little seasonal canvases all year long. Thanks for stopping by! Love the watercolor effect of this card! This is such a great project! Love the colors! Ready for fireworks now! Love this card. Nice work! I love your canvas and all the others you've done because you are not afraid to use different products or get your fingers dirty which I think is half the fun, this canvas is just so awesome and I wish you luck! What a sweet little canvas, and so divine for the upcoming holiday! The mini canvas is so CUTE! I love your easel idea. Donna, this is wonderful! I also love your little easel! What a fabulous canvas! Love the patriotic theme! Fabulous! I'm going to try this on a card.